Sure, you can keep your grocery list on paper, but that hardly prevents you from forgetting to pick up the milk on the way home. In a busy family, it’s hard enough to keep track of whose turn it is to go to the store today, let alone whether you need milk. So how do you keep the entire family on top of what’s needed, so no one ever has to make a second trip to grab the most important item? That’s where high-tech solutions come in. A good grocery app can solve all your shopping problems, letting you share a single grocery list with everyone in the family plus save money with coupons, organize your list to help you speed through the store and lots more. Best of all, grocery apps are a convenience that doesn't cost much. Many are free or have a small fee for premium features. 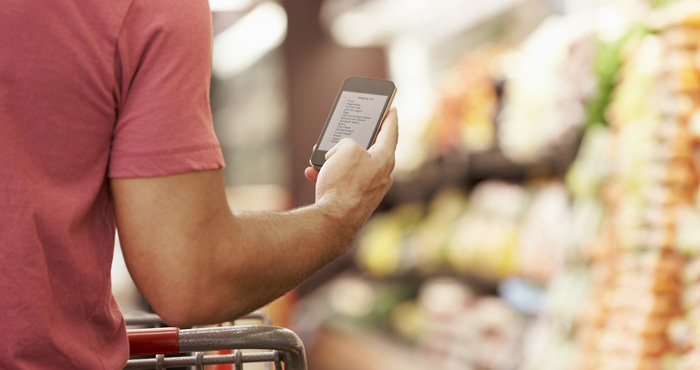 If you’re ready to streamline your grocery shopping routine, here are our favorite apps. Easy to use and free, OurGroceries is our top choice for keeping up with a complicated grocery list. You can create one or more grocery lists by manually entering items or scanning the product barcode (premium Android version). If you prefer using voice controls to quickly add items to your list, use Amazon Alexa or Google Home; Siri users are unfortunately out of luck. OurGroceries remembers items you’ve entered in the past, so once you’ve created your first list, you can build future lists even more quickly. To keep everyone on top of what you currently need from the store, share lists with anyone else using the app, even if you use an iPhone and your spouse uses an Android. And if your smartphone is out of reach, you can check your lists from the OurGroceries website, too. An in-app payment of $5 per app gives you access to the premium version of OurGroceries. This removes ads and adds a few handy features, including the ability to add photos to items so you can be sure to get exactly what you want. Android premium version users can scan barcodes and check grocery lists via Android Wear smartwatches. 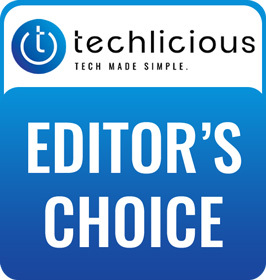 The app is a little less compelling for iPhone users, but it’s still a solid list-making option, and it’s great for households with both iPhone and Android devices. Even with a grocery list, it’s all too easy to forget to pick up that one thing you need most, whether you walked right past an item you needed or just didn’t realize you were out of milk. That’s where List Ease comes in. The app has all of the features you need to make a grocery list, but it really shines in helping you keep track of what’s in your pantry and reminding you when you need to pick something up. 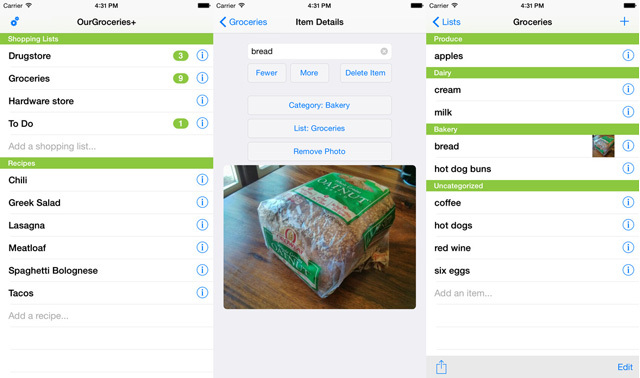 The list-building features are what you would expect from a grocery list app. Build grocery lists quickly by typing to search for items, scanning barcodes or copying items from your last shopping trip. List Ease tracks items in your pantry to help you build a pantry list just like you would a grocery list, so you can keep track of what you have at home. Your pantry list can include quantities of items, and you can note when you should buy more (for example, when you’re down to a half gallon of milk). Though keeping your pantry list up to date takes a little time, it means never getting home only to realize you’ve run out of an essential. All of your lists sync for the entire family, so no one else can forget an item, either. You’ll get notifications if someone else does the shopping, so you’ll never accidentally over-buy, either. Savings-savvy shoppers will already be familiar with Shopkick, but this rewards app recently added groceries to its lineup of deals. 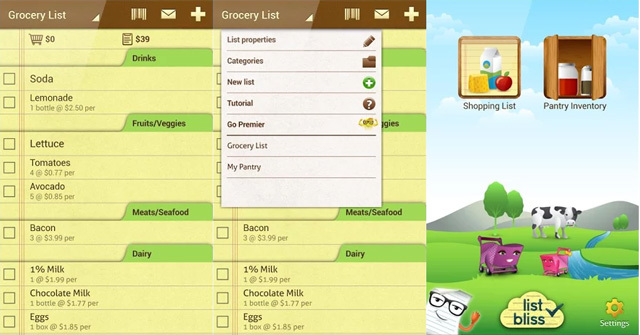 The app’s grocery list features are basic but do everything you need. Type to search for the items you want, and Shopkick automatically arranges them by department for easy shopping. Featured recipes offer suggestions on what to make for dinner, and the ingredients can be added to your list with a single click. The focus of this app, however, is earning cash back for trips to the grocery store (and plenty of other stores on top of that). Earn reward points, called kicks, by walking into the store, scanning product barcodes, buying items, scanning your receipt and more. These kicks can be redeemed for gift cards at stores like Sephora and Starbucks, or donate them to charities like the American Red Cross and Feed America. As you build your grocery list, Shopkick lets you know if there are any deals on offer for what you need. You can browse through deals directly as well. This grocery app’s biggest advantage is the fact that it goes beyond groceries, letting you rack up rewards for all kinds of shopping. 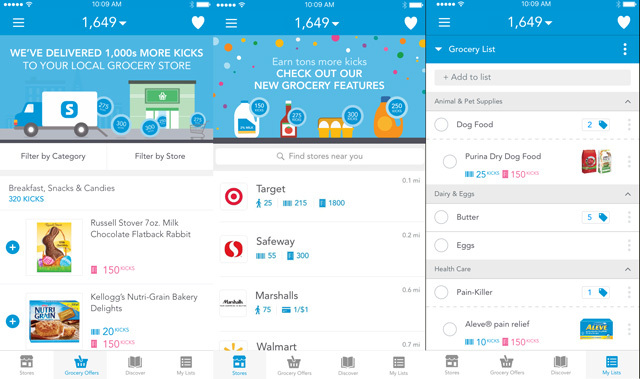 If you’re looking to earn rewards for groceries and more, Shopkick is the way to go. While there are plenty of great grocery list apps out there, the downside for Apple users is that none of them are Siri-friendly. And that’s a shame because voice controls offer the quickest and easiest way to add items to your grocery list, meaning you’re less likely to forget about them. 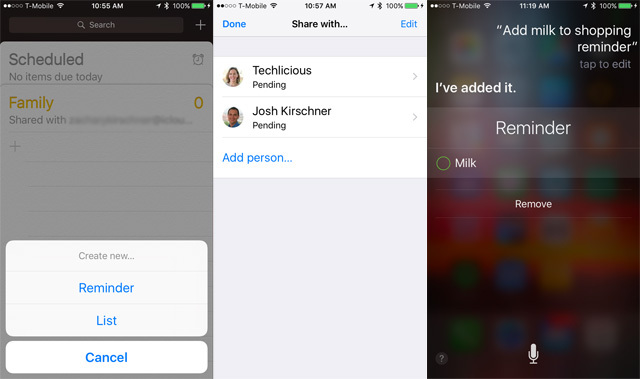 If Siri is a must, your best bet is to use Apple’s built-in Reminders app. This general-purpose app isn’t designed specifically to keep track of groceries, but it has all of the list-building features you need to build a simple shopping list. Lists can be shared with other Apple users, too. Click Edit on your newly created list, then Sharing, then Add Person. Now the whole family can see and update the list, so no one will forget anything at the store. I’ve tried several grocery list apps and Wunderlist works great. No extra purchases, works on iOS, Android, Web, and Chrome extension. You can print your list. It remembers removed items. Plus you can do other list-based work in the app. If you need cross-platform and printing capabilities Wunderlist can’t be beat. I use GotMilk and it is amazing! Same features as these apps but not as cluttered looking. I like OutofMilk. Not as busy as the ones you show. AnyList, can be shared between family members, also can use Alexa to add to or modify list. Don’t know if there is an Android version. So I am concerned about the legitimacy of List Ease. I have been using the app for several days and love it. My husband downloads it as well. I then signed up with a password. He went to sign up on his phone using my email and password . For some reason the password didn’t work. I thought maybe I mistyped something. I clicked on “forgot my password”. They sent me an email to reset the PW. I clicked on it and it took me to safari but the page wouldn’t open. It said there had been too many redirects. Happened on our computer as well. I cannot find any way online to contact them. An email or phone number. Any help or advice from anyone would be appreciated! Groliste is an another app to prvent food waste and help to maintain your pantry items smartly. My favorite disappeared fromfrominmin just the last 2-3 weeks! List Okay worked really great for my household. I could enter an item, the amount I needed, AND the Price. You set up the tax rate for your area and it would give price per item and a grand total after you entered the last item. I wanted to put it on my tablet (already have it on my cell), but just looked and it isn’t there. The only contact they list is an email address. Has anyone else heard of this app? Sorry about the awful mistake.my keyboard messes with me sometimes.